Yes, I did all the trouble shooting steps one should do before officially being upset and frustrated: checking the volume under settings, turning the iPhone and Apple Watch off and on, and even erasing the Apple Watch setting it back to factory settings and setting it up as a new Apple Watch, even though I had a backup. After testing the sound by using timers, and trying to make phone calls from my watch, none of that worked. This meant I had a few days to really see how going without the Apple Watch would actually impact me. Apple offers free services at the Apple Store, including free technical support at the Genius Bar and free workshops to help customers learn more about using their Apple devices. Several months ago, the process of signing up for a Genius Bar reservation changed and now requires using an Apple ID to register. Today, Apple has again updated the Genius Bar reservation workflow. 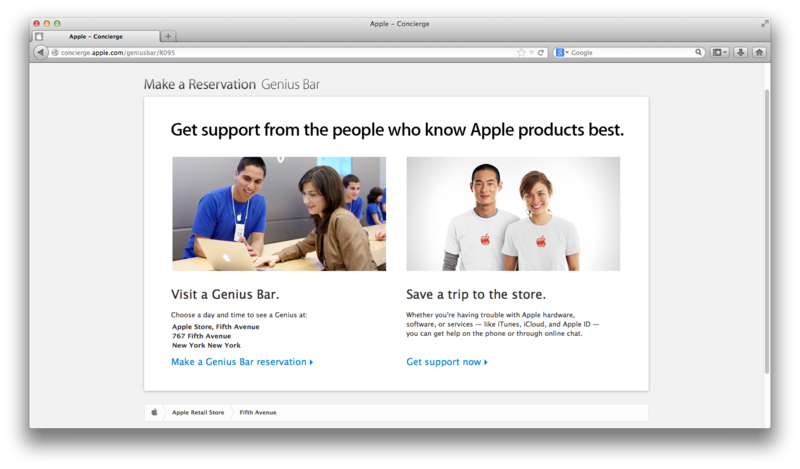 Before signing in with an Apple ID, consumers are presented with a new page that highlights the various online support tools that Apple offers. If desired, users can continue with their initial plan of making the reservation for the Genius Bar, or can try to “save a trip to the store” by working with an AppleCare representative online. If the issue in question involves iTunes, iCloud, or Apple ID services, AppleCare can help customers for free regardless of whether any of that customer’s Apple products are still covered under AppleCare. For hardware- or software-related issues, AppleCare does offer pay-per-incident fees, or offers the option to purchase AppleCare if the product is still covered under the original warranty. Recently the AppleCare support website was updated with 24/7 chat support, and customers were offered the option to initiate screensharing on their Mac with AppleCare representatives. With this new page, it seems Apple is hoping customers will conduct basic troubleshooting at home before making a trip to the Genius Bar, which will hopefully cut down on the number of appointments booked for simple issues and provide customers who really do need Genius support with even more timeslots to choose from. Rumor has it Apple’s media event tomorrow will have a strong education focus, something that seems even more likely with the recent iBooks 3.0 leaks. Of course, the fact that Apple is about to unveil its lowest priced iPad has also lead to talk that students and education might be the target audience during the iPad mini’s unveiling. TNW reported first that Apple’s event would focus on educational content—specifically iBooks. We have also independently heard that educational content is being prepared for tomorrow’s presentation. Today, Bloomberg Businessweek backs up those reports by adding that “Apple executives plan to make a point of highlighting the iPad’s educational capabilities at tomorrow’s event.” The report cited sources familiar with the preparation of tomorrow’s events, and it noted that Apple has “realigned its education sales force to emphasize iPads.” While most analysts seem to agree iPad mini will help Apple continue to dominate the education tablet market, one thing they can’t agree on is price. Verizon is set to announce shared family data plans for smartphone and tablet users. PhoneArena obtained a leaked screenshot (above) that indicated Verizon plans to launch its shared family data plans soon. The service will allow customers to pay one data fee for the entire family and all their devices. As seen in the screenshot, family data usage is calculable for e-mail, web surfing, and other data tasks extending to 30 GB and beyond. Pricing and other details are not revealed in the leak, but it seems like Verizon is just weeks away from debuting the new system. Now let’s hope fair rates launch with the carrier’s upcoming strategy. In related carrier news, Sprint plans to offer its Total Equipment Protection coverage for the iPhone. Today is the last day you can purchase AppleCare+ for your iPhone 4S or iPhone 4, if you purchased it on October 14th or after. AppleCare+ was announced along with the iPhone 4S, and is available for $99 (two years). The plan not only gives you phone and genius bar support coverage, but also accidental damage coverage with a $49 service charge. The plan covers up to two accidents. $99 is a pretty solid insurance policy (Square Trade offers the same). However, for new iPhone 4S purchases, the AppleCare+ protection plan can be purchased with the device on that day. Today was just the end of the grace period Apple instated for pre-orders. Thanks for the reminder Marco!